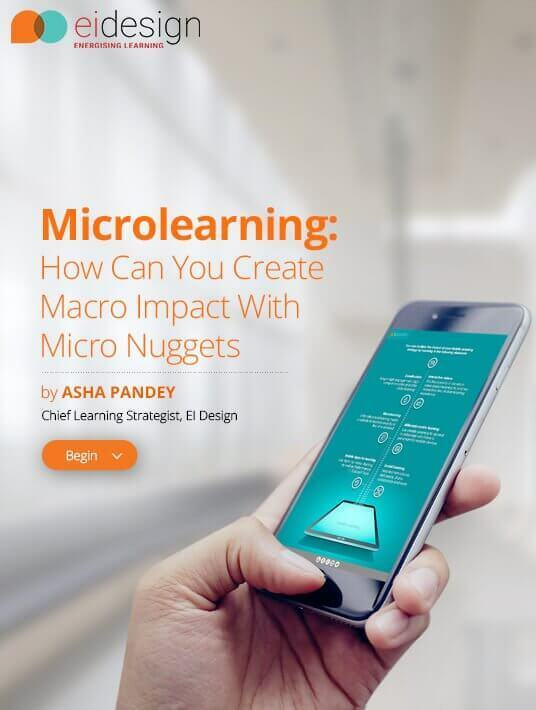 Gain insights on what is Microlearning and why this approach should be a significant part of your learning strategy. See how you can incorporate it in your training to offset challenges of dwindling attention spans and distractions, plus see a positive impact on your ROI. Through several examples, see how you can use Microlearning based learning approach for your varied corporate training needs including Formal training as well as for Performance Support (just-in-time learning aids). Gain insights on why Microlearning is the flavor of the season and how you can use it to offset several challenges (including dwindling attention spans, distractions, and other challenges that L&D teams face today). Understand the basics of Microlearning approach and gain answers to your related queries on what it can do (or cannot do). Gain insights on how your learners and businesses can benefit from Microlearning. Is Microlearning Right for You? Get an understanding on how can you determine if Microlearning would work for you. Get to know how you can apply Microlearning based training for all types of corporate trainings. Look at several examples to see the impact this can create for your learners and business. Gain insights on the process you can use to design an effective Microlearning strategy and the innovative formats that you can pick from to deploy your training. See how Microlearning will impact your training ROI positively and what more can be integrated into your Microlearning strategy to double the impact of your training. Any learning strategy that can impact Recall, Retention and Application will be able to demonstrate a positive impact on the ROI. As we have seen so far, Microlearning approaches appeal to the learners, lead to high completion rates and package information that can be applied precisely at the time of need. Designed to meet the mandates of knowledge acquisition, application and behavioural change, Microlearning based training will establish a clear value for the business and ROI. Discover the wide range of benefits that Microlearning offers your organization and employees alike, and how you can use it as the basis of your online training strategy.